Chicago once had one of the world’s largest streetcar systems, more than 500 miles of line on nearly 100 routes by 1935. Horsecar service began in 1859, and was supplanted in the 1880s by a large network of cable car lines. In the 1890s, electric “trolleys” proved more efficient and the cable cars were replaced by 1906. 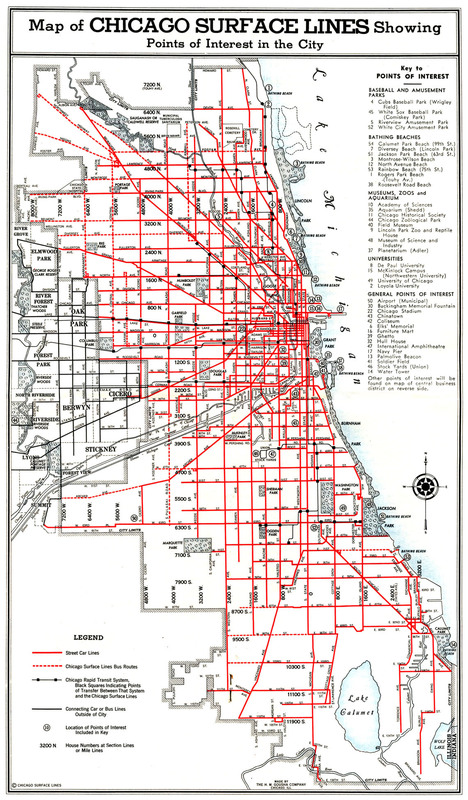 Beginning in 1914, the various companies holding franchises for different parts of the city operated as a single system known as Chicago Surface Lines. More than 3,700 large red streetcars plied the city’s streets by 1935, and 680 new streamlined green PCC cars began arriving after World War II. The new public agency Chicago Transit Authority took over the streetcar system in 1947 and began to integrate the surface lines with the city’s elevated train network. In the 1950s, CTA decided to phase out streetcars in favor of motor and electric trolley buses, and Chicago’s last streetcar ran in June 1958.